It’s Never Too Late For Safety! Safety is the most important issue in the building and construction industry. To further increase awareness of topical issues in site safety Pro-Visual Publishing has released the 2014/2015 edition of the NSW Construction Site Safety Guide. This easy to read Guide, supported by the Master Builders Association and the Australian Constructors Association, is distributed to construction companies and specialist contractors in New South Wales to ensure that site safety is a priority for all and to make available easy access to best practice information for all involved in the industry both on sites and in offices. The updated information on this year’s Guide takes account of the latest trends in workplace health and safety and covers areas that have seen some significant incidents in recent times. The 2014/2015 Guide provides practical information on safety management plans, scaffolding safety, fire safety and the safe location of underground assets. More detailed information can be accessed on site by using the QR codes on the Guides, which direct managers to specific regulations and guidelines. 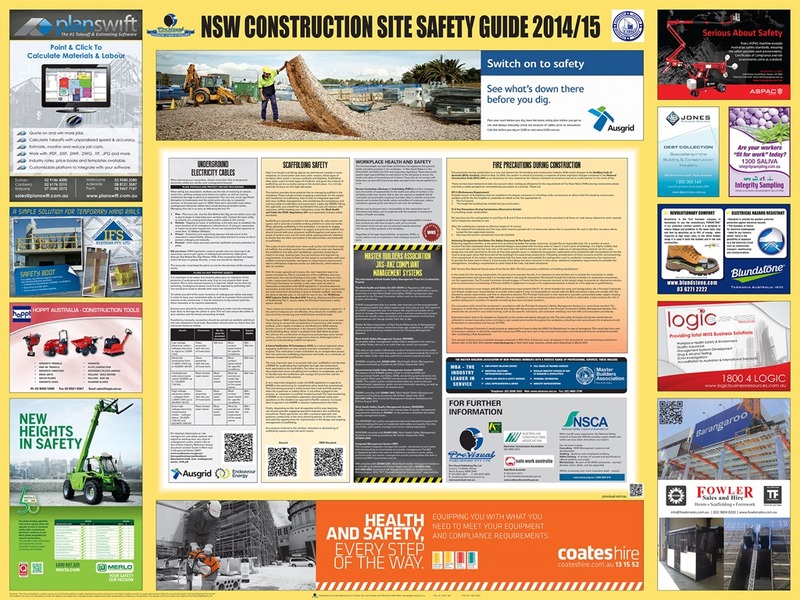 “I would like to thank all of the sponsors of the NSW Construction Site Safety Guide 2014/15. Their support has made it possible for the guide to be distributed free of charge” – John Hutchings, CEO, Pro- Visual Publishing. Pro-Visual Publishing is the leading specialist in wall-mounted workplace health & safety, food safety, hygiene, health and wellbeing information resource charts. Each chart is practical and informative, providing a quick reference point for management and staff. Pro-Visual Publishing’s charts are designed to inform, motivate, educate and above all keep people and their workplaces safe!